Editor’s Morning Note: Shares in Box are up today. 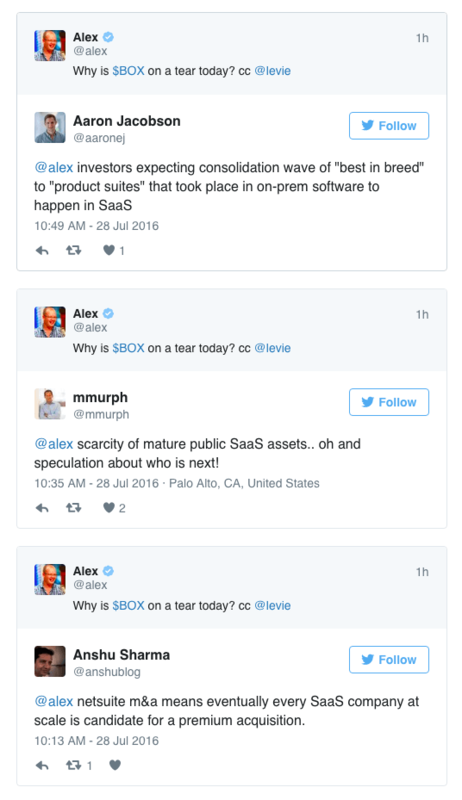 Is that good news for cloud companies, SaaS startups, or just Box? The author is the person pictured above who eats carbs. Box is up more than 5 percent today, following news that Oracle will buy NetSuite for $9.3 billion. The move boosts enterprise-facing M&A for the quarter and the year to date, stoking speculation that other companies may be in play. Acquisitive markets can spur more deals, and push prices higher. So, if investors think that a company is a potential takeover target, higher deal volume can bolster its short-term valuation. Think of it as a speculative sugar rush. That’s likely at least part of the reason why Box is having a good day. To summarize: Consolidation, scarcity, and consolidation. This fits our pace and price notes from above. Why focus on Box, when the above concepts apply to other companies? That’s the point, but in reverse. Box’s share price increase gives us insight into how investors are valuing not just Box itself, but other analogous companies that are both private and public. So we us Box’s motions as indicative of sentiment shifts in concerns that do not trade as freely. Companies that are still private, for example. Is it fair to constantly use Box as a test case for market dynamics? No, but we don’t need to feel bad; corporations aren’t people, after all. Box brought this upon itself by being a very interesting, and visible SaaS play. As such, we get to use it as a cornerstone for market analysis. Today, Box tells us that investors are at least hoping for increased SaaS M&A. That’s good for public SaaS companies trading at lower-than-historic multiples, and startups hoping to juice their valuation in whatever round comes next. After all, when exits are in the air, all bets look more sure. Speaking just the two of us, I doubt that Box’s internal leadership wants to sell; it’s been too tough a road to get to today to soft-land into a larger corporation when the consistent revenue growth that SaaS always promises has finally arrived. If Box doesn’t get to cashflow breakeven before it sells, if it sells at all, it will be a letdown.